Small DC brushless motor with inner-roter,low vibreation and audible noise on operation. Diffirent size and length linear motion unit with DC motor. 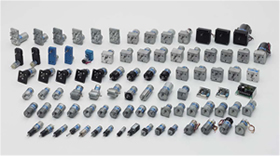 Small gear pumps with DC gearmotor,suitable for dring despenser,veding machine and other many applications. Tsukasa rotary actuater series are suitable for damper actuater of air-condition system, Addtionaly also avairable for other various applications.